Diversification is a well-known way of getting the proverbial free lunch: By spreading money across different kinds of investments, you can earn the same return with lower risk (or a higher return for the same risk). What if we are missing out on another free lunch? That free lunch is time diversification. 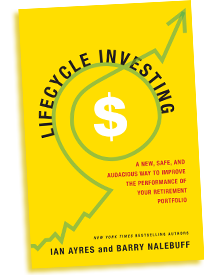 In Lifecycle Investing, Ian Ayres and Barry Nalebuff—two of the most innovative thinkers in business, law, and economics—have developed tools that will allow investors to better diversify their portfolios across time. By using leverage when young—a controversial idea that sparked hate mail when the authors first floated it in the pages of Forbes—investors can substantially reduce lifetime risk while improving their returns. Clearly written and backed by rigorous research, Lifecycle Investing presents a simple but radical idea that will shake up how you think about retirement investing.